OdiO is registered trade mark owned by THL. The ultimate in connector performance, consider the new Silver Bullet Plug®. The contact pins are machined from hard drawn 4-nines pure silver rod, and then treated with Caig Preservit 5PL - which leaves a microscopic protective coating to prevent oxidation and enhance conductivity. 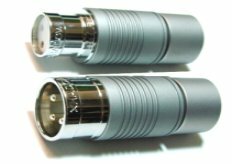 Sound quality is in the highest league, with subtle but significant improvements over the standard tellurium copper plug. Ideal for silver interconnects and any high performance cable.